The Red-tailed Hawk is the most common hawk in Alaska. This another polymorphic hawk, presenting a bewildering variety of colorations. In fact, the dark morph, “Harlan’s Hawk,” was at one point thought to be a different species. In Alaska, look for the dark head and the dark “belly band” and you’ve probably got a Red-tailed. In flight, it’s a little easier. Red-tailed Hawks breed throughout interior and southcentral Alaska. 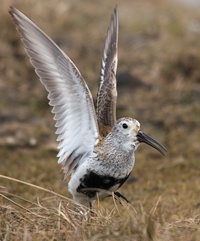 Alaska and Canada birds migrate to the southwest U.S., to Mexico and Central America and even to northern South America. Elsewhere in the U.S. they are present year-round. I love our Boston Red Tails. First time I was one it was sitting 5 feet away from me in a tree. Beautiful sight.